There are only few matches remaining in the fifa world cup, quarter final matches can be watch on sony espn with malayalam commentary. kerala soccer lovers enjoyed 2018 edition fifa matches in own language commentary. sony espn this time aired all matches with bengali, tamil, telugu and malayalam commentary. sony liv app also streamed all fifa matches with multi language audio feed. 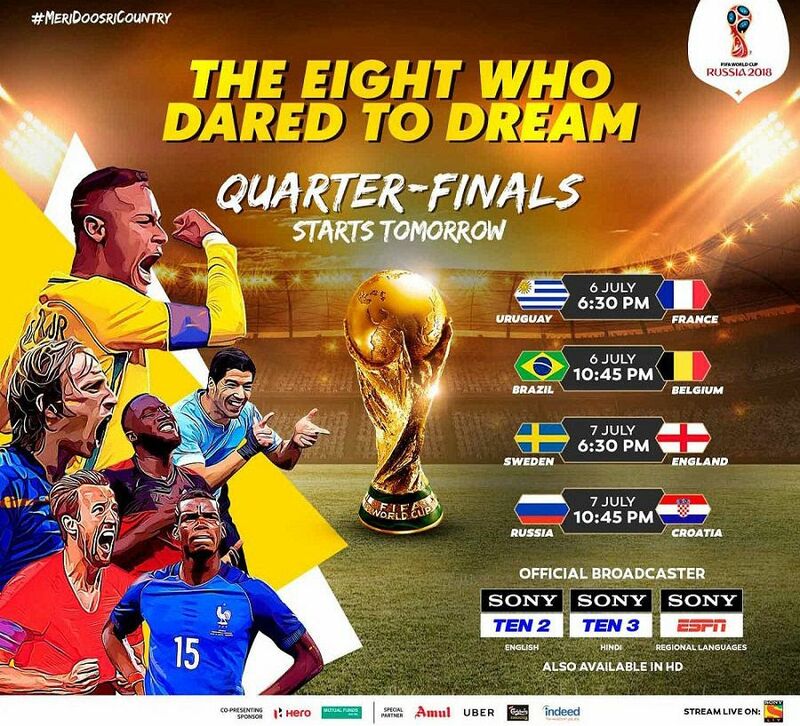 2018 fifa quarter final matches will air this friday and saturday through sony espn, sony ten 2, sony ten 3 channels. Group stages of 2018 FIFA World Cup Russia end strong with over 153 million viewers tuning in to Sony Pictures Networks India (SPN). Uruguay Vs France is the first quarter final match of 2018 fifa world cup, 6th July 2018 at 6.30 P.M is the time for this match. sony espn will air Uruguay Vs France fifa quarter final match with malayalam commentary. second match is between Brazil and Belgium. Sony espn and other sony sports channels will cover the live telecast of Brazil Vs Belgium match at 10.45 P.M (IST). 3rd fifa quarter final match is between sweden and england, 7th july 2018 at 6.30 p.m is the telecast time for this match. Russia vs Croatia is the 4th quarter final and it will telecast at 10.45 P.M (IST). All these matches will be available through sony liv app and sony espn with malayalam commentary.